There was a lot of “turnover” this week at Owl Moon Raptor Center. 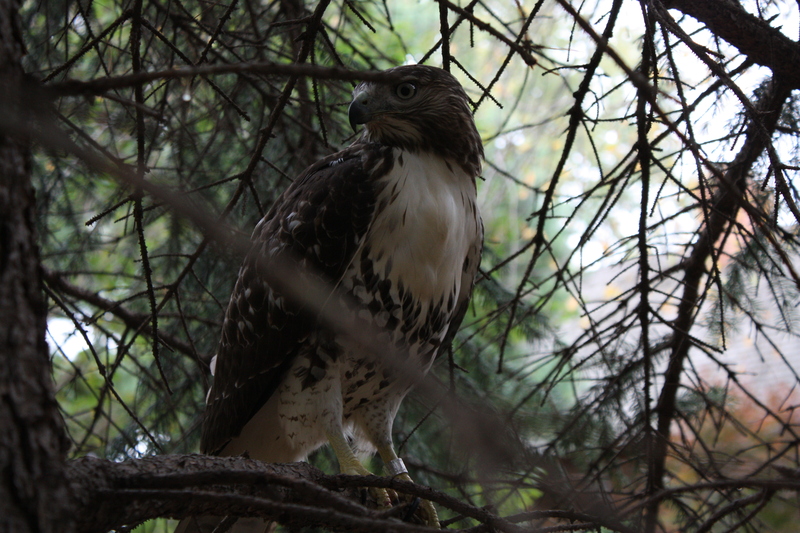 We gained two great horned owls and released two red-tailed hawks, in that order. On Thursday, Oct. 20, I received a call from Zoe in Middletown about a great horned owl that had been on the ground in her garden since Sunday. His wing appeared broken and his inability to hunt for food left him emaciated and dehydrated. Birds of prey get most of their water from their prey, so even though Zoe put a bowl of water out for the owl, he was unable to stay hydrated. On Friday, I brought the owl to our vet, Barb Stastny at Opossum Pike Veterinary Clinic in Frederick, MD, for x-rays. The radiograph showed he had a transverse fracture of the humerus, the upper bone of the left wing. The fracture was over 4 days old, but fortunately still repairable (any older and it would not be). Barb took the owl into surgery to insert a pin in the bone and stabilize the fracture and he is now recuperating in an indoor kennel, receiving antibiotics, pain medication, and regular meals, along with frequent bandage changes. His wing needs to be wrapped to his body to further stabilize the fracture. He vehemently objects to the bandages, and destroys them as fast as we can replace them! While at the vet, Barb introduced me to another great horned owl. This owl also had a broken wing. Moreover, he had been kept in an inhumanely small crate for two to three weeks, and the crate had not been cleaned for much or all of that time. As a result, the owl had destroyed all of his flight feathers, and what was left were matted and coated in his excrement. This fracture was too old to repair, but given the proximity to the joint, there was never an option for surgery. We hope that the developing callus will not impede movement in the joint, but only time will tell. I offered to transfer the owl to my care at OMRC. With MD Department of Natural Resources’ (DNR) permission, this was done, and the owl is now residing in a clean, over-sized dog kennel with a large water bowl that allows some self-bathing. He will be transferred later this week to Tristate Bird Rescue and Research Center in Newark, DE for bathing and long-term care (in a flight cage), to allow his feathers to molt and replace. Happily, the week ended on a high note when we were able to release our two red-tailed hawks; “Obiwan,” a juvenile male, and “Puff Mama,” an adult female. Both had recovered from suspected cases of West Nile Virus. They were strong and healthy, and VERY ready to be set free. Obiwan went back to his home neighborhood in Olney, MD. Puff Mama required a long drive to get her home to her territory near the PA line in Forest Hills, north of Baltimore, MD. Once there, her rescuer, Billy, had the honor of releasing her from his own hands in his brother Gabe’s back yard. Puff Mama took off like a flash, and landed in a distant tree to look around. When we next saw her she was passing high over our heads, a wonderful sight.